With the whole second part of Burial at Sea taking place with Atlas (Frank Fontaine), its nice to occasionally see Andrew Ryan scattered around the city. Following on from my Burial at Sea review last week, I decided to play through the entirety of the second piece of DLC due to the fact I’ve purchased it all well after their original release date (The advantages of Steams summer sale and late purchases you see). Please be warned, this review will contain spoilers, so if you have yet to play the DLC or are planning on purchasing it and don’t want the plot points spoiled, look away for now and come back next week. So the game starts off with you playing as Elizabeth, walking around the beautifully created Paris talking and meeting different passers-by as you explore the streets. Eventually, you chase Emily, the main girl Booker was chasing in part 1 of the DLC, and finally wake up to find yourself looking into your dead fathers eyes. Looking up, you find a group of gang members playing Russian roulette with your life just outside of the vent where Booker was trying to pull Emily out. You tell the gang (that turns out to be Atlas’ gang) that you can bring them to the surface, out of their depths to get back to rapture and let atlas have his revenge on Andrew Ryan. In doing so, you also tell the lie that you’re one of the chief scientists assistant, meaning you definitely know how to get the gang out. So hence forth, your mission is to get to the scientists lab to then save the city, getting Emily back from her captors. 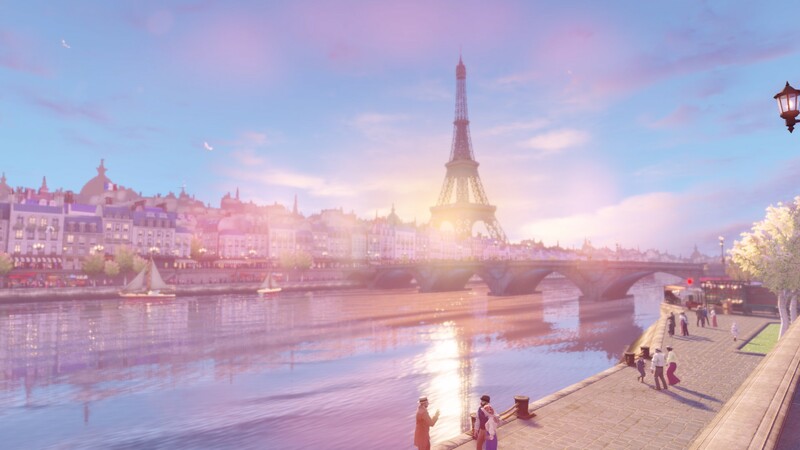 Paris is lovingly rendered whilst you play as Elizabeth. I genuinely didn’t want to progress with the campaign and wanted to soak in all Paris had to offer. The game starts out with a pretty big plot element, as well as gameplay element, with Elizabeth finding her dead body against the wall in the starting area, meaning this is a new Elizabeth who doesn’t have the ability to open tears in time. I say this is a big game play element, as it now means that Elizabeth has to rely on her skills in sneaking around and knocking people out rather than her brawn that Booker relied so heavily on. This is explained quite nicely, but also can be seen as a little annoying considering we’ve seen Elizabeth open tears for 2 games, and this time cannot do it ourselves. Burial At Sea part 2 is long. Very Long. For a piece of DLC this could have been a game in itself, with myself putting in 7 hours of game time, with barely any proper exploration and missing 2 audio tapes. This is partially due to the fact you play as Elizabeth, a fact the game pushes you to understand every few moments whenever you encounter enemies. This is due to the fact Elizabeth is not a fighter, so cannot take much damage, meaning the gameplay differs from other Bioshock games in the way it is no longer an action game, but stealth. Throughout most of the game, I was crouching the whole way, ensuring no enemies would see or hear me as I traversed Raptures darkest places. This was actually fairly refreshing for a game that relied far too much on its action sequences, something that hasn’t been toned back in part 2, but has been tweaked to make the experience more enjoyable. Make no mistake, you may be playing as Elizabeth, but Burial at Sea is all about the little sisters and the bid daddies. In this DLC, you’ll learn of their origins, and how they became so inseperable. 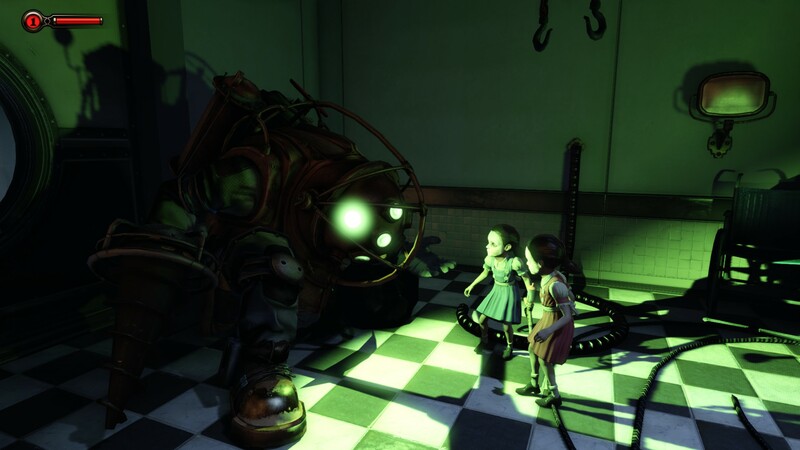 The game is split up like a traditional Bioshock game, with the main task at hand on the opposite end of the world, with enemies between, and when you get to your location, you find that you actually then have to go elsewhere before you can continue with your progress. It’s one way to extend the length of the game, but can become quite tedious, as you know nothing is ever as easy as it seems. Each section is broken up into parts where you sneak behind enemies and knock them out (using either your tranquilizer crossbow, or smacking them on the head), then a section where you get to take in your environment, and another to explain a bit more story. It all becomes predictable after a while, meaning you know that when you take out the next few enemies, you’ll be able to continue to explore the environment, looking for coins and audiotapes to find out more about the world of Rapture. My problem with this DLC and it’s mechanics stems more from the location the DLC takes place rather than the actual playability itself. The game pushes Elizabeth into a setting she didn’t really need to exist in in the first place. Bioshock 1 was beautiful, and amazing, but didn’t need to justify its existence through Elizabeths powers. The whole thing just feels like a prequel to Bioshock 1, something that didn’t need to be done at all. 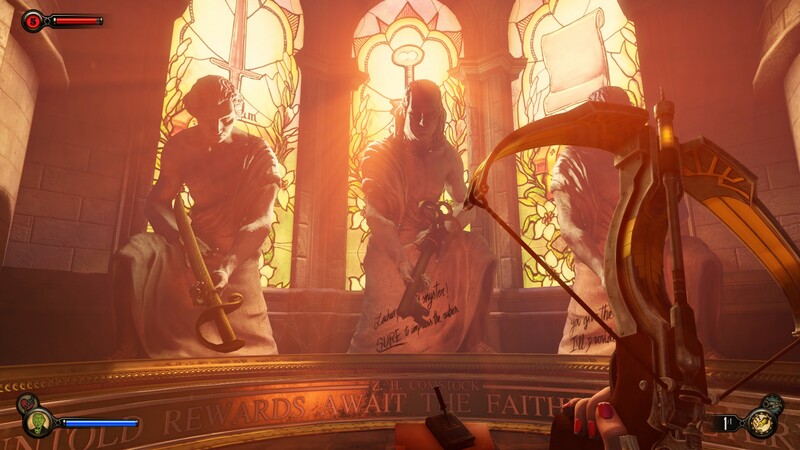 In your long playthrough of Burial at Sea part 2, you’ll travel back and forth between Columbia and Rapture, ensuring you see as much of the world of Bioshock as possible before its eventual demise. The aesthetic of rapture hasn’t changed much from part 1 of the DLC, but the opening scene in Paris, and the return to Columbia makes the dark, dreary corridors of Rapture seem even more dreary after visiting bright and lovely places. Graphics, as always, are brilliantly detailed whilst not being too demanding for your computer. It’s crazy how much detail and art irrational manage to squeeze out of the Unreal engine, especially considering how little geometry there is in the world and how its all textures. The art department at irrational deserve a pat on the back to say the least. Burial at Sea episode 2 was a fantastic piece of DLC to play through, but only for its new mechanics rather than the extra story it introduced to the Bioshock universe. The whole thing felt very much like when everyone complained about the ending of the TV show Lost, with it feeling like nothing had actually ever been accomplished in its own right. 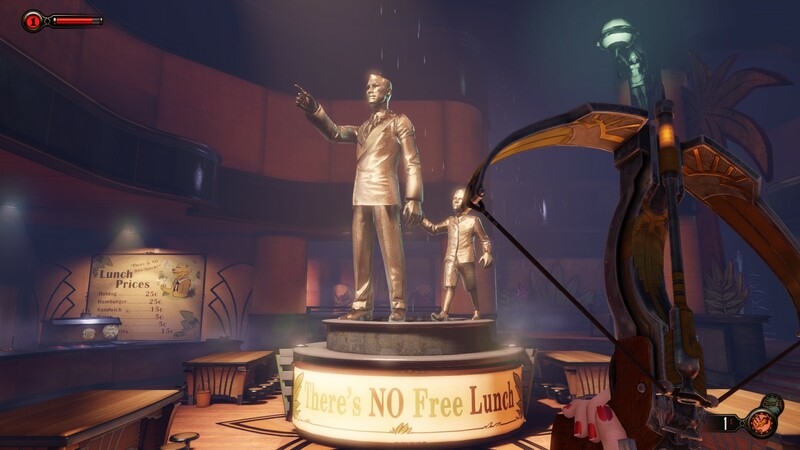 By all means, enjoy this second part of the Bioshock DLC, but know this: it won’t feel like you’ve done anything at all or worthwhile in the grand scheme of the narrative.